In addition to using the touch manipulation events to handle translation of an element, we can use the same mechanisms to allow a user to rotate an element using touch. We can do both translation and rotation in the same event handler. The ManipulationDelta object gives us both a translation (vector) and a rotation (angle). Both are automatically incorporated into the ManipulationDelta object, based on how the user is touching the screen. The user can translate by sliding one finger around and can rotate by placing two fingers on the object and rotating it. We transform the element by calling two different functions of the underlying Matrix, for both translation and rotation. 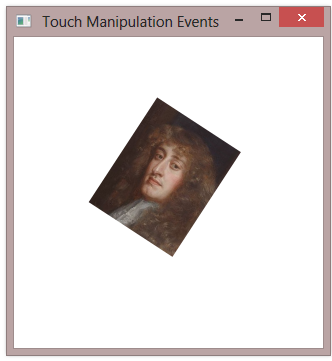 Here’s the XAML, containing a single Image control that we’ll interact with. Here is the source code, with the updated ManipulationDelta event handler. No, the manipulation events are unique to touch input. You can handle different events, however, to deal with mouse input. Well, remember that a mouse will only have one contact point, whereas touch can have many contact points. To rotate an element with touch, you’d use two contact points, so you can detect the points rotating about a center point. This isn’t possible with a mouse because you only have one mouse pointer. Typically, to rotate something using just a mouse, you’d add an additional control, like a slider or something.